Hey there. Our good friends over at Flump Studios are at it again and have released another GREAT XBLA game! 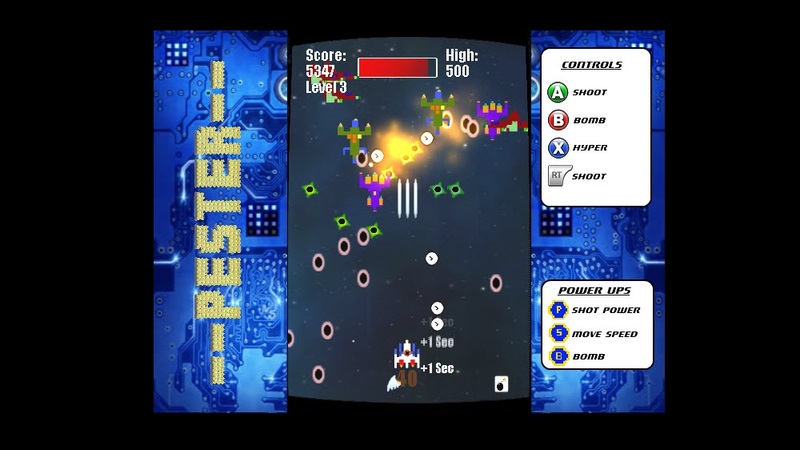 Super Killer Hornet (SKH) was pretty cool and now they have released Pester, another great shooter that takes me back to the days of Gradius and Galaga. Pester is currently available at the Xbox Live Marketplace for a mere 80 MS! Before we get into the game itself, I want to give a little info on Flump Studios. Flump Studios is an up and coming small indie game developer and they are based in the UK. They have been working on games for about a year now and have developed a few mobile games before their SKH release on Xbox Live Arcade. Pester is their second game into the marketplace and I believe they are already working on thier next title. I respect all game developers but it's something about the indie titles that I feel more drawn too. I feel as if they are living their dream and it's pretty cool to see thier hard work finally pay off. That's a big reason why I enjoyed Indie Game: The Movie... but that's for another post. Now... my thoughts on.... Pester! First off... I LOVE THE RETRO FEEL OF PESTER! As soon I started playing it, nostagia hit. Instantly, memories of Gradius, Galaga, Darius Twins, and other great space shooters that I hold dear to my heart, came back to me. The top down view is similar to that of Galaga but you have the free range of motion of Gradius. I also enjoy the look of the game as it reminds me of an arcade cabinet. SKH had the same feel but Pester really nails it. I just can't say enough of the old school retro look of Pester. I love the backdrops and I love the music. The overall visual presentation of Pester is spot on and extremely well put together. Pester is fairly easy to play that practically anyone can pick it up and get the hang of it right away, but just in case you forget, the button confirguration is right there on the right side (once again, reminiscent to the arcade cabinet). The premise is straight forward as well. You're a fighter jet type space ship thingy (aren't they all? lol) and you shoot down the enemies, collect coins and power ups, while you avoid getting hit. Coins are merely there to increase your score and as you progress through the game, power ups will drop that will enhance your speed, fire power, or provide you an extra bomb. If you are powered up and end up dying, your firepower downgrades. I loved that because some shooters will simply start you over with 0 upgrades. That can be a killer when you're in the later stages. By downgrading your power ups by 1 level, it assures that you still have a chance against some of the faster and tougher enemies. Bombs are praticular useful in Pester. Not only will it clear the screen of enemies, but it will also obliterate any "bullets" on the screen. It's a great way to get yourself out of a jam. Pester also features a Hyper Drive which is pretty cool. At the top of the screen, there is a Hyper Drive bar that gradually fills as you take down your enemies. Once it fills up, you can activate the Hyper Drive and it will instantly take you to that level's boss. That's pretty damn cool, if you ask me. It's especially useful when you're screen is filling up with enemies and bullets are everywhere and you don't want to lose any of your upgrades before reaching the boss fight. 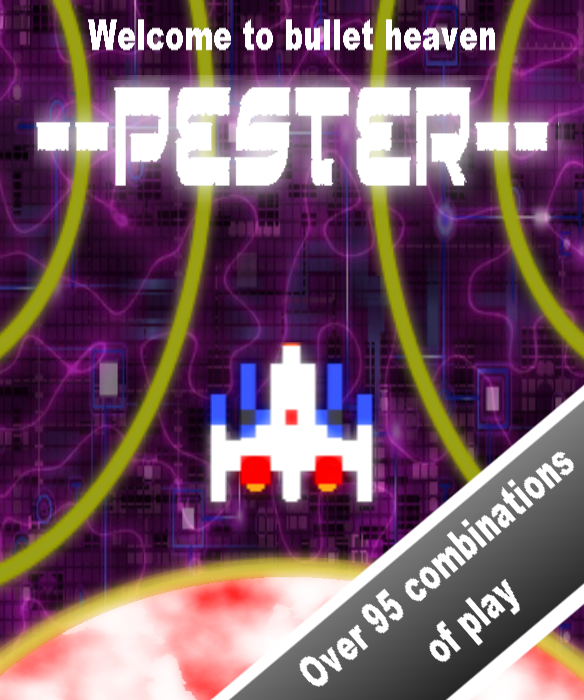 Pester also features several game play modes, including multiplayer! I know that there was at least 2 different game modes and over 95 different combinations of play, but I didn't get a chance to play through all of them. Quite frankly, I just couldn't stop playing the arcade mode! Each time I died, I wanted to get back and start again. lol Pester really is that entertaining. To get a better understanding of Pester and it's gameplay, check out the trailer below! Pester is one game that you should definitely check out. If you are growing tired of shooting down UAVs and snipers, give Pester a try. It's one of the better games out on the Xbox Live Marketplace at the moment. The game gives a nod to the founding fathers of shooters and it doesn't disappoint with it's fast and frantic play. For 80 MS points, you simply cannot go wrong with tapping to your past and experiencing that fast pace thrill all over again. Flump Studios, you have yourselves a winner with Pester! Also, I'm happy to announce that the guys behind Pester and Flump Studios have agreed to be our guests on our Podcast! The Flump Studio team will be our special guests and we will discuss Super Killer Hornet, Pester, and all things Flump Studios. I can't wait to have them on our show! If you have any questions for an indie game developer, want to tell Flump Studios what an awesome game Pester is, or any other questions for Flump Studios, please feel free to leave them in the comments and we'll make sure to ask them when they're on the show! So what do you guys think of Pester? Later! Awesome review man, so glad you liked it. Feel like we've really managed to step it up from SKH. Hey there Paul! Thank you! Pester really does deserves the praise that it's receiving. I can't wait til we have you on the show discuss! It's an interesting and promising game.I would like to try it.